Wire rope clips are available in galvanized or stainless steel material and are used to make terminal ends, lap splices, loop ends or thimble eye ends on wire wire assemblies. 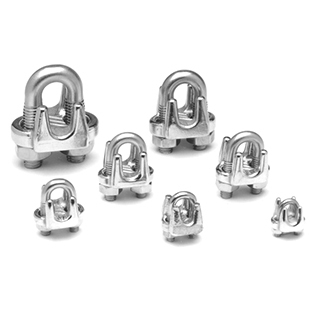 As an alternative to swage sleeves and wire rope thimbles, wire rope clips are an economical way to make cable assemblies in the field and can be used in a variety of ways. DuraBrite™ quick links, delta links and wire rope clips, are long lasting, durable and dependable.